Magma accumulating in a shallow subsurface reservoir tends to have a lower density than the crustal rocks within which the reservoir is embedded. Intuitively, then, buoyant stresses derived from this rock-magma density difference should contribute to how a reservoir evolves, and many volcanologists argue that magma buoyancy is a critical driver of magma reservoir rupture that leads to eruption. Quite recently, two increasingly cited 2014 papers published in Nature Geoscience continued this trend by contending that rock-magma density differences in fact produce sufficient buoyancy to destabilize a massive magma reservoir, leading directly to rupture that can yield a supereruption. Magma buoyancy, of course, is just one of many stresses that will interact to dictate the stability of a magma reservoir, and it is important to examine these stress interactions carefully when characterizing reservoir rupture and the possibility that an eruption will occur. In a 2007 paper published in the Journal of Volcanology and Geothermal Research, for example, I used elastic finite element models to show that rock-magma density differences, relative to the other factors involved, play almost no role in the rupture of a small magma reservoir, i.e. one typical of what is found beneath a shield or composite volcano (Figure 1). Fig 1: For host rock of density 2600 kg/m^3, rupture location (at small arrow locations in (a), at depth h=0 for all cases in (b)) is invariant for magma densities ranging from 1000-3400 kg/m^3 [for full details, see Figure 6 in Grosfils (2007)]. More recently, via a 2015 paper just published by the Journal of Volcanology and Geothermal Research, colleagues Patricia Gregg (University of Illinois Urbana Champaign), Shan de Silva (Oregon State University) and I expand upon this earlier analysis of magma buoyancy to assess the role buoyancy plays in larger, supereruption-sized systems. 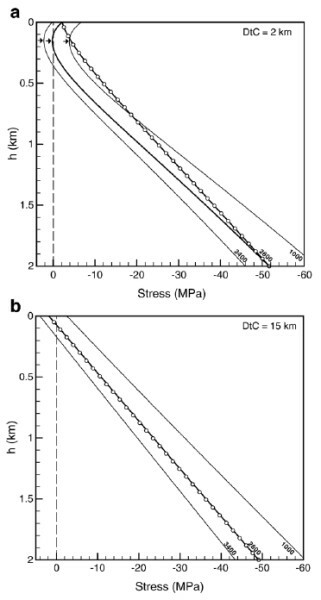 In addition to challenging the validity of the quantitative methods employed in the two 2014 Nature Geoscience papers, we use time- and temperature-dependent viscoelastic finite element models to demonstrate that, for immense magma reservoirs, rock-magma density differences–even when carried to an extreme–are insufficient to destabilize the system, induce rupture, or trigger an eruption (Figure 2). 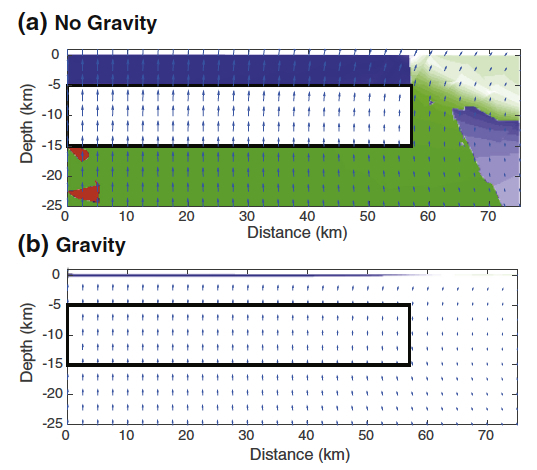 Fig 2: When buoyancy is treated without correctly integrating it into the complex suite of stresses in the host-reservoir system, significant deformation and faulting is predicted (a), but modeling buoyant stresses as an integral part of the system reveals that it has minimal impact (b) [for full details, see Figure 5 of Gregg et al. (2015)]. This outcome is consistent with previously articulated characteristics of large caldera-forming eruptions, and after eliminating buoyancy as a critical factor we continue to argue, as articulated by Gregg et al. 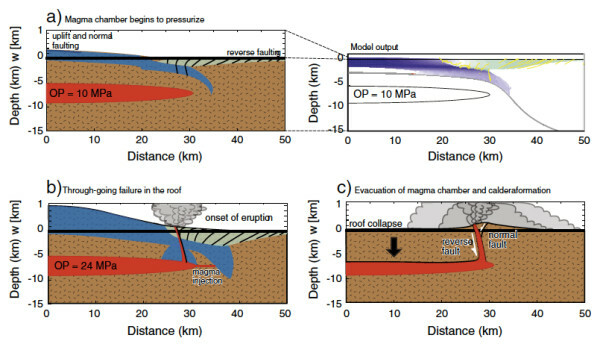 (2012), that external triggering assisted by other reservoir-internal factors (Figure 3) is currently the most plausible model for the conditions that lead to rupture of the massive magma reservoirs capable of feeding some of the largest, most devastating eruptions on Earth. Fig 3: Cartoon of viscoelastic model results depicting incremental reservoir pressurization and fault evolution for a supereruption-sized magma reservoir system [for more details see Figure 10 of Gregg et al. (2012)]. Grosfils, E.B., Magma reservoir failure on the terrestrial planets: Assessing the importance of gravitational loading in simple elastic models, Journal of Volcanology and Geothermal Research, 166, 47-75, 2007. Gregg, P.M., S.L. de Silva, E.B. Grosfils, and J.P. Parmigiani, Catastrophic caldera-forming eruptions: Thermomechanics and implications for eruption triggering and maximum caldera dimensions on Earth, Journal of Volcanology and Geothermal Research, 241-242, 1-12, 2012. Gregg, P.M., E.B. Grosfils, and S.L. de Silva, Catastrophic caldera-forming eruptions II: The subordinate role of magma buoyancy as an eruption trigger, Journal of Volcanology and Geothermal Research, 305, 100-113, 2015. Wordpress powers Research. Layers theme Designed by Jai Pandya.